So how does God’s love work? How does it change us from the inside out? Here’s a helpful illustration that highlights the process. Illustration by Blake Berg, 3DM Publishing. God wants to be our Dad, plain and simple. Because He loves us, He invites us into His family. This is a free gift that cannot be earned. “See what great love the Father has lavished on us, that we should be called children of God! And that is what we are” (1 John 3:1 NIV). When we accept this gift of grace through Jesus, we become a new creation. Our identity changes. Who we are has nothing to do with our performance. It has nothing to do with what people say. The only thing that matters is what God says, and God says we’re His kids. “Therefore, if anyone is in Christ, the new creation has come: The old has gone, the new is here” (2 Corinthians 5:17 NIV). We’re now secure in God’s love. We’re free to obey Him because we love Him, not to earn His love. Even if we blow it, we are still His. Our identity isn’t based on how we do. It’s based on who God says we are. Obedience is just living in a way that’s consistent with who we are in Christ. We don’t obey God to make him love us. We obey God because He loves us. “In fact, this is love for God: to keep his commands. And his commands are not burdensome” (1 John 5:3 NIV). Too many of us start with obedience and try to earn our way to the Father by “being good.” This is what leads to all of the problems I listed earlier. 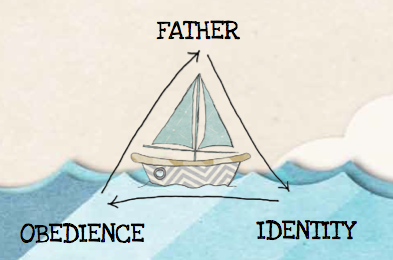 It’s only when we anchor our hearts on the Father’s love that are we free to grow (and fail) in grace. The number one way you can help your child embrace this truth is to live it out yourself. If we are trying to earn God’s love, that will come out in our parenting every time. If we see God as a tyrant, we may become that tyrant ourselves. If, however, we live out of our new identity in Christ, secure, confident and free, then we will parent out of the grace we have received. In Ephesians 3:18 Paul prays for the Ephesian church, “may you have the power to understand, as all God’s people should, how wide, how long, how high, and how deep his love is,” and that is my prayer for you and your family today. Spend some time this week in God’s word and see what He says about His deep love for you. Soak in that grace and let it overflow in your parenting. Teach your kids about God’s grace by living in it every day. If you’d like help talking about God’s love as a family, check out God’s Big Adventure, a book of family devotionals that’s all about the great love story and adventure story of God. In God’s Big Adventure, we explore what it means to be loved by the Father, receive a new identity and obey God as the overflow of His love. This entry was posted in family discipleship, parenting and tagged christianity, God's love, grace by jasonbyerly. Bookmark the permalink.